A visit to some of China’s wineries and vineyards shows a budding industry still working out the kinks. A few months before the 2008 Beijing Olympics, I read a blog post by an Atlantic Monthly correspondent about Chinese wine. I grew up outside New York City, where I ate hundreds of pounds of lo mein and pork-fried rice but didn’t see, taste or hear of Chinese wine. Even when I traveled to China in 2009 and 2010, I saw drinkers mostly tossing back beer and baijiu (Chinese liquor). 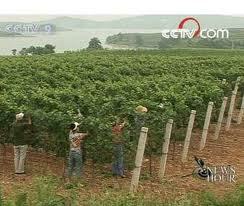 But Western-style wine is attracting the attention of China’srising middle class. Some Chinese buy red wine from Bordeaux, France, a purchase that wine experts say connotes high social status, and according to the Datamonitor Group, a London-based market analysis firm, China’s domestic wine industry generated more than $6 billion in revenue in 2008.